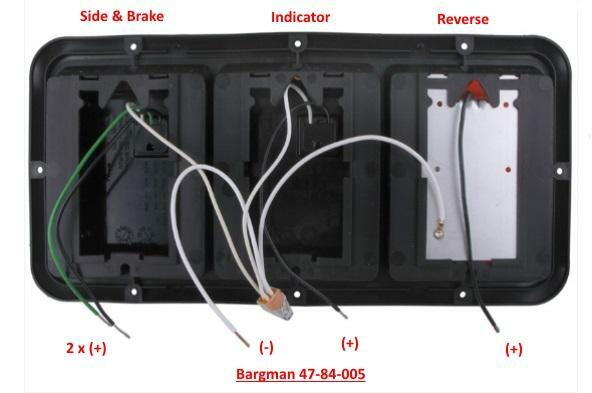 I have purchased two Bargman 48-84-009 rear light units, but I’m having difficulty connecting them. In the old setup, the outer light was for tail+stop light, the middle for signaling and the inner light for reversing. I think the new units have both outer and middle LED’s illuminating simultaneously for tail, signal and stop, is that correct? Problem we are facing is the side marker light, which seems to work like tail+stop light where is should only remain as tail/running light. I tried looking online for the model (48-84-009) you posted but don't find it. Your old lights seem to be like the units I see on Bargman's web site. I don't know how I missed it 1st time around! Odd they don't supply a picture (like I posted) or diagram showing how to wire them up. Could you post a picture of the back of yours. Are there 2 wire going to 2 of the lights or just 2 to the outer light? Also perhaps a picture of the wires on your old lights. I assume this is what you've got. I'll further assume that the 2 black wires will both connect to your old 'tail light' wire. 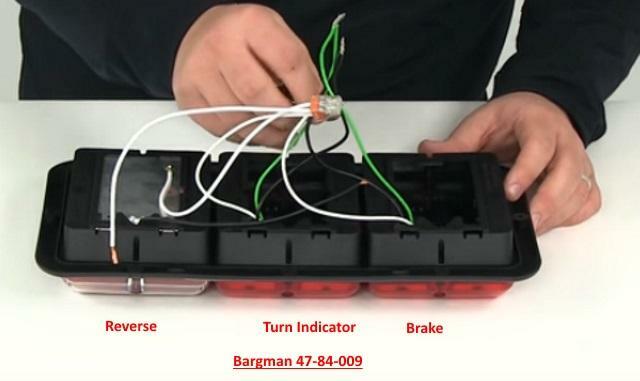 One of the green wires will connect to your old 'brake light' wire, the other green wire to your 'turn indicator light' wire. The remaining black wire to your old 'reversing light' wire. Of course the white wire(s) are your ground. It looks like you might need a multimeter to figure out which wire is which. Winnebago wiring diagram Pdf attached. Hi Derek, thank you very much for your help. It is strange indeed that they don’t supply a wiring diagram. I will get back to you. We did use a multimeter to figure is out, but when connecting the side marker light to the taillight, things went wrong, so that might be the culprit?